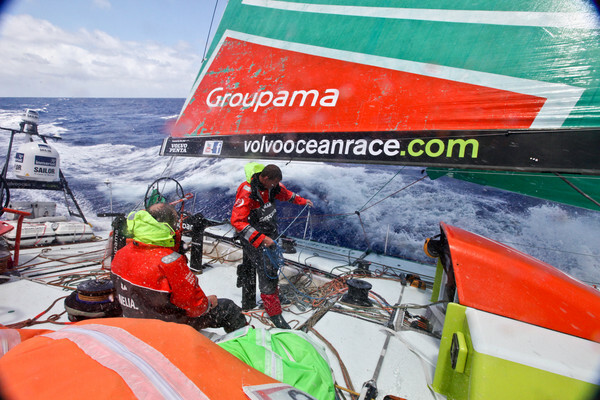 Franck Cammas and Groupama 4 today led the five boats currently racing in Leg 2 of the Volvo Ocean Race to Abu Dhabi into an anti-piracy 'Stealth Zone' and towards the light air lottery of the Doldrums. It will be the second time the fleet has crossed the Doldrums this race and there is much head-scratching going on as navigators consider how to negotiate this hurdle in the quickest way possible. The Stealth Zone covers the Indian Ocean from the northern tip of Madagascar to the United Arab Emirates and while the teams are inside, their exact locations will be hidden from the outside world, though their relative positions in the race will still be given in terms of Distance to Leader. The French are still racing Groupama 4 as hard as they can to gain as many hours as possible over the chasing pack but recent gains have not been substantial and PUMA’s Mar Mostro is still in touch as they wait for the light airs and squally conditions that will slow everyone down and could provide a chance for the fleet to compress. “No Doldrums are tidy, but these Indian Ocean ones are a long way south of the equator and it’s summer in the Southern Hemisphere at the moment. Those things combined make for a much more dynamic Doldrums than we are used to in the Atlantic. They are the Doldrums we usually cross – we don’t often come this way,” he said this morning. The big question for the navigators to consider is which end to choose for their crossing. To complicate matters, a tropical wave has formed between nine and six degrees south, which will cause veered winds at the western end of the Doldrum-belt and backed winds at its eastern end. On the northern side of the wave, the fleet will face very light winds and little squall activity. Addis says PUMA are probably about 80 or 90 per cent set on the western option, so the crew is sailing the boat low and fast. “That’s our preferred option, but nothing is set in stone. We can still make a course change,” he said. Telefónica (Iker Martínez/ESP) and CAMPER (Chris Nicholson/AUS) are sailing fast to leeward of PUMA’s Mar Mostro in east-southeasterly trade winds and are looking to set up for the eastern end, but the options are still open. “Generally it’s first in, first out,” observes Addis. 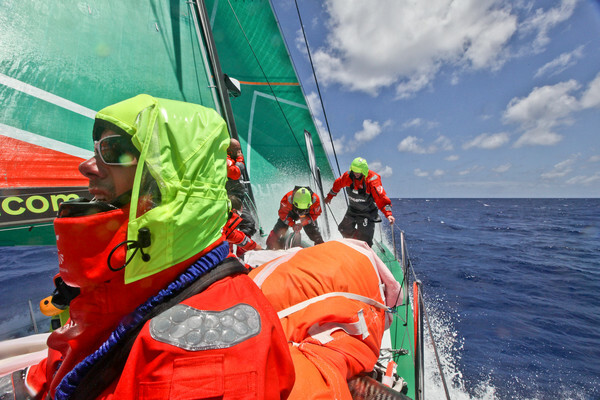 A further 235 nautical miles back, Ian Walker is preparing the crew of Abu Dhabi Ocean Racing's Azzam for their first crossing of the equator in this race, having retired from Leg 1. Flying fish are being harvested, no doubt for use as sacrifices when King Neptune comes to call. The introduction of the stealth zone is part of a series of security measures implemented by race organisers to combat the threat of pirates operating in a vast area off the coast of Somalia. The fleet is currently racing towards an undisclosed ‘safe haven’ in the Indian Ocean where the boats will be loaded onto a ship for transportation through the worst affected waters to a point off the Sharjah coastline in the northern Emirates. Once there the fleet will resume racing to Abu Dhabi, the first Middle Eastern stopover in the Volvo Ocean Race’s 38-year history.